Anyway. So there's this quilt. I picked it up thrifting a few weeks ago. It was one of those finds that stopped my breathing momentarily, and I couldn't quite breathe right again until I got out of the shop and into my car. Safe from anyone snatching it away, or any other of the other ridiculous things that I imagined might prevent this blanket from becoming mine. It's a mix of hand and machine stitched, with quite a bit of wear and fading. Which only makes me love it more...that it was once really loved a whole lot. But the fabrics. Oh, my. Amazing. Can you see the prints? two bluebirds with 'love in bloom' written; a duck with an umbrella and 'singing in the rain' written; and then those amazing multicolored mod-looking trees and people. I have no idea how to date that fabric, but I am quite curious. 50's, perhaps? Or later? Last year? I never can tell, really. 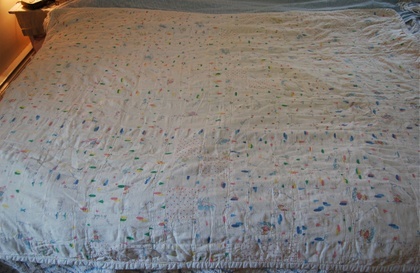 Sadly, photographing a quilt is a wee bit challenging. 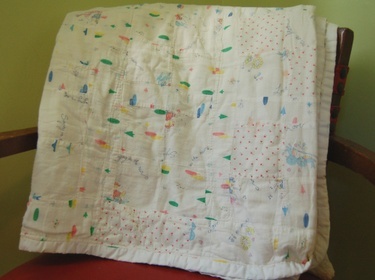 Photographing a mainly white, and faded quilt is a bear. The photos today are my third attempt. But I hope you get the gist. Because it's really quite lovely, and I'm so thrilled that it's new home is with me.